Uganda's leather industry is still in its infancy stage of development characterised by poor production and lack of value addition. It is estimated that in the financial year 2008/9, Uganda lost revenue equivalent to US$ 249.7 million by exporting of raw hides. Over 90% of leather products are imported, despite the huge potential in the Common Market for Eastern and Southern African region. Of the 25million pairs of shoes annually demanded in Uganda, 1 million are produced locally and the 24 million are imported mainly from Europe, North America and Asia. Hides from Uganda are naturally of high quality, texture and heavy substance, making them suitable for the production of excellent leather products. To produce graduates with skills in hides and skin flaying, handling, grading and preservation, wet blue leather production, leather shoe making, leather bags and briefcase making, wallets and other leather products making. 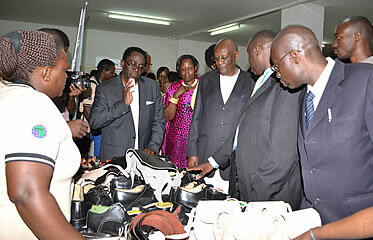 To contribute to the development and transformation of the underutilized leather production sector. To produce skilled graduates who are job creators in leather related enterprises. Target group: Those interested in building attractive industrial, business, professional and service careers in the Leather industry.